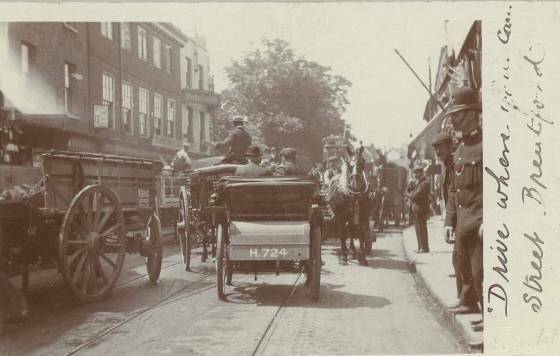 Howard Webb provided this fun postcard image annotated by the writer "Drive where you can street Brentford'. It was taken outside Wakefield, the photographers, at 137 High Street. Wakefield was next to St Lawrence's Vicarage and the trees in the background are from the churchyard (the church tower is just visible above Wakefield's). The first view shows the central section of the card. 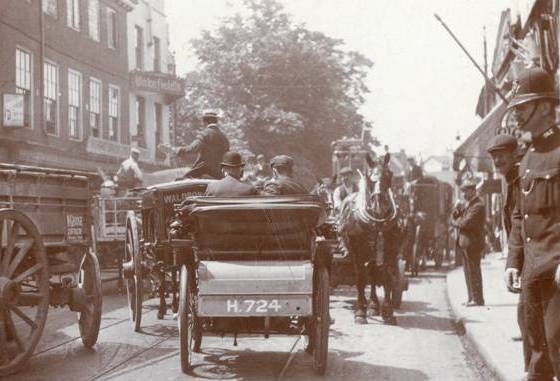 Howard's high resolution scan alows details to be picked out: 'W George, Contractor, Chiswick' on the nearest cart, 'Waldron' where the straw-boatered cart driver is doing a left hand signal. Some shop signs are visible on the left: Butler (Albert Butler, leather merchant, lived at 134 High Street in 1901 and is also recorded here in a 1907 trade directory), Horne Bros, bootmakers (136 High Street in 1907) amd Wakefield at 137. 'American Cream Soda 1d' advert is at 135 High Street where Joseph Heusch, confectioner, traded in 1901 and 1907. I hoped it would be possible to find Lottie French in either the 1901 or 1911 census, but she was not at a Roehampton address. She may have been in service: W H Peech, a steel manufacturer born in Sheffield, was recorded at this address in the early 1900s. 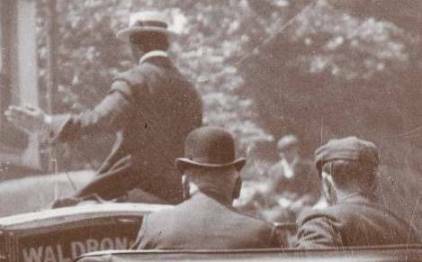 The final images are enlargements: a study of three hats and a policeman. Do let me know if you recognise him!